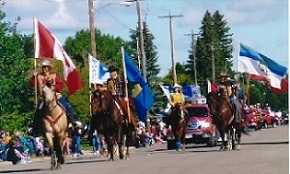 Participants are required to read the parade manual and complete and submit the registration form prior to the parade. 2018 Parade Manual now available. The Parade Route is 3.2 kms long (2 miles). Plan accordingly when considering your walkers for distributing candy. New location: Horses and horses trailers are asked to unload beside the Iron Horse Trail (53 ave) between 46th & 48th Street in St. Paul. (Between B & D Industrial & Fountain Tire). We kindly ask horse entries to STAY OFF the PAVED WALKING TRAIL adjacent to the recreational trail. 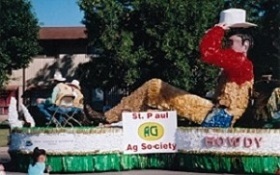 The Ag Society thanks you for your cooperation. Cash prizes and ribbons presented for 1st ($25), 2nd ($15), 3rd ($10) place in their respective categories. Participating ‘Kids’ receive a ribbon and $10. Thank you to the above sponsors for the support.